A Loyola University New Orleans alumnus along with a former student were recently ordained into the Roman Catholic priesthood in early June. The Rev. Raul A. Navarro, S.J. '83, MBA '86, M.S. '95, a geology graduate, was ordained a Jesuit priest of the New Orleans Province June 8. The Rev. Daniel H. Green, a former political science student at Loyola, was ordained a priest in the Archdiocese of New Orleans June 1. Navarro was born in Mexico City and moved to the U.S. at age 12. At Loyola, Navarro first became acquainted with the Society of Jesus and also found a place that would become his academic and professional home for nearly two decades. After graduating from college, he worked at Loyola in the Financial Affairs Office and earned two more degrees, including a master's degree in education and an MBA. He was also active in university ministry and assisted at student retreats, while discerning a Jesuit vocation. In 2002, Navarro entered the novitiate of the Jesuits and spent two years in Grand Coteau, La., before taking his vows in 2004. This was followed by philosophy and theology studies at Loyola University Chicago. As part of his regency assignment, which is meant to deepen the spiritual integration and the human maturation of the Jesuit in all its aspects, Navarro taught at Strake Jesuit College Preparatory in Houston, Texas, and helped open the Cristo Rey school there. Following regency, Navarro studied theology at the Jesuit School of Theology of Santa Clara University in Berkeley, Calif., where he earned a master of divinity degree. Among his memorable formation experiences are his mission trips to Mexico City and trips to Guadalajara and the Philippines, which was his first visit to his parents' homeland. Following ordination, Navarro will serve at Immaculate Conception Church on Baronne Street in New Orleans. Green served as the president of the Student Government Association while at Loyola. During his time at the Notre Dame Seminary in New Orleans, he interned at St. Andrew the Apostle, St. Matthew the Apostle, St. Peter Claver and a hospital chaplaincy in Houston while his diaconate internship was performed at Our Lady of Perpetual Help, in Belle Chasse, La. 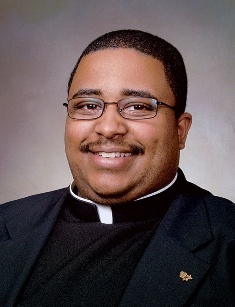 Green has been assigned to serve as a new priest at Visitation of Our Lady church in Marrerro, La. “I hope to let others know the love of God so that they might come to know him and be followers of his in a deeper and more intimate way,” Green said.